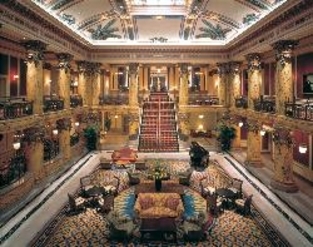 The Jefferson Hotel is reminiscent of a more gracious era. Guests of The Jefferson enjoy a variety of amenities and services, unmatched by any other luxury Richmond hotel, with two award-winning restaurants, 24-hour room service, a complimentary on-site health facility including an indoor swimming pool, and complimentary wireless high-speed internet access and local telephone calls. Centrally located in the heart of downtown Richmond, Virginia, The Jefferson Hotel is just blocks from the state capital, historic Shockoe Slip, the Richmond Convention Center and Richmond’s financial district. All of Richmond's most popular shopping, entertainment venues, museums and restaurants can be reached using the hotel's complimentary transportation. The Jefferson Hotel has also been recognized as Richmond’s premier venue for elegant weddings, flawless meetings and conventions and the city’s most well attended charity and social functions. Whether visiting Richmond for business or pleasure or a local resident celebrating a special occasion, allow The Jefferson Hotel to make your visit a memorable one. Your search for "Richmond Hotels" has ended.